November 2018: Newest version uploaded. 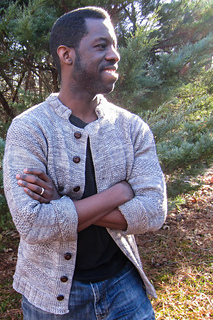 I designed this lovely cardigan with comfort and wearability in mind. It’s perfect for wearing to work or for Saturday errands. I shaped and sized it for male wearers but it would be lovely on any body. I wanted something that my husband would actually wear but was also interesting to knit. The name of this piece pays homage to a certain mining game that has captured the heart of everyone in my home (including myself). The color of this yarn along with the texture put me in the mind of ‘The Nether’- a dark and brooding dimension within the game. And yes, I’m planning kids sizes too. 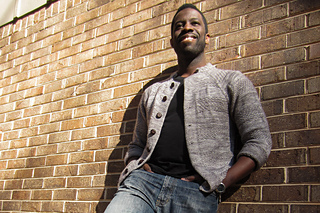 Details: The cardigan is worked as a top down raglan with a stand up collar. Stripes of smooth stockinette are alternated with slipped stitch sections that give a textured but sleek look. The hem and sleeves are finished with 3x2 ribbing. 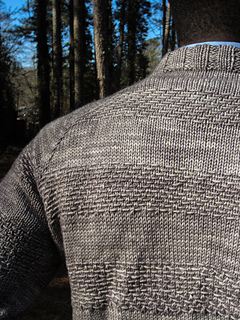 There is optional back shaping to give the sweater a more tailored look as shown in the samples. This design is suitable for an adventurous beginner.